The official start of spring is upon us. Piles of snow are melting away under the power of glorious sunshine. While winter may very well have another gasp or two in it, the time has come to get ready for a new season. That means dealing with the grime and clutter that tends to build up during cold weather. When it comes to spring cleaning, don’t forget your Memphis Wood Fire Grill and your outdoor cooking space! As with most tools, your Memphis Wood Fire Grill works better when it is properly maintained. That means regular cleaning, including a thorough cleaning at least once a year. Spring is the perfect time to make sure your Memphis Grill is ready to go. There’s no doubt that cleaning your Memphis Wood Fire Grill is not as much fun as using it to make delicious food. But, as with any recipe, the best results are only possible if you follow the steps correctly. Seasoning is good for your Memphis Grill. Filth is not. Our step-by-step guide will help you leave the flavor-enhancing aspects of a seasoned grillwhile protecting your grill and you from the dangers of accumulated dirt and grease. Remember, DO NOT spray your Memphis Wood Fire Grill with a hose or use any chemical cleaners or water to clean the inside of the grilling chamber. The cleaning process is relatively straightforward. Watch our 14-step guide to the thorough cleaning we recommend you do on a yearly basis. The video provides clear instructions and a few product recommendations to make your cleaning process a success. 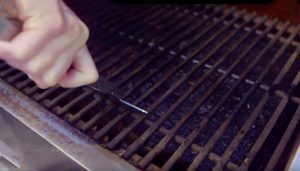 If you prefer working from a list rather than trying to stop and start a video while you do the work, we have provided a 23-step instruction guide to cleaning the cooking chamber, hopper and exterior of your Memphis Wood Fire Grill. The end result will be a grill that is sleek and beautiful on the outside and ready to deliver optimal flavor and performance on the inside. The labor is well worth the results you will get from your Memphis. Along with cleaning your Memphis Grill, now is an excellent time to consider your outdoor cooking space. De-griming concrete patio surfaces is a good place to start. Follow that up by pressure washing exterior steps and siding to remove the dirt, salt andmildew that can accumulate over time. Be careful of tiled surfaces, however, as pressure washing these can cause damage. At this point, you may want to bring out your patio furniture and take steps to get it ready for use again. This might be as simple as hosing off the table and chairs, or more labor intensive like scrubbing cushions and making minor repairs. Don’t forget to clean your patio umbrella, as they may have become home to a spider or two during their time in storage. If you have questions about your Memphis Wood Fire Grillor are looking to upgrade to the versatility, precision andexcellence that only a Memphis provides, visit a Memphis dealer near you or contact us today.